06.03.2011 - French win group B, as Hamburg secure third place. Presov finish VELUX EHF Men’s Champions League without a victory. 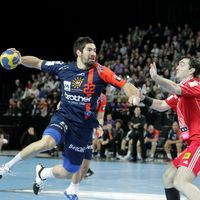 06.03.2011 - The final decisions of the Group Phase in the VELUX EHF Men’s Champions League. Rutenka: "Going for the title"
04.03.2011 - Siarhei Rutenka, four times winner of the VELUX EHF Men’s Champions League, will play against his former club Celje with Barcelona. 03.03.2011 - Ciudad Real group winners after victory in Romania, Schaffhausen already qualified for the Last 16.